So you don't have to spend a fortune on flights, we've travelled around the globe to find the world's best bathrooms for you. 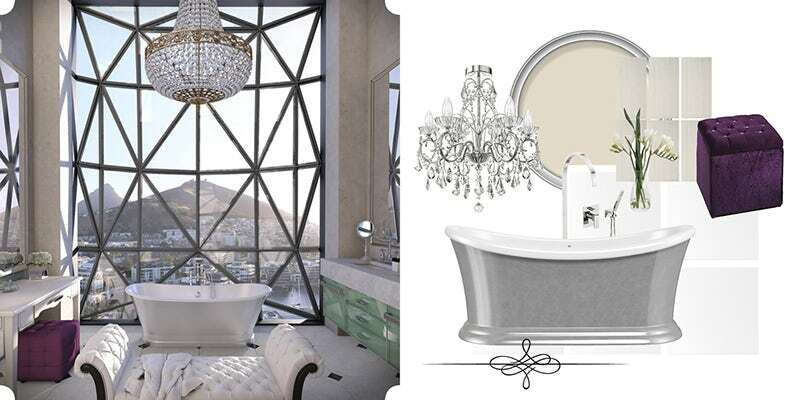 Check in and check out these stunning hotel bathrooms, as we show you how they can be recreated in your own home. 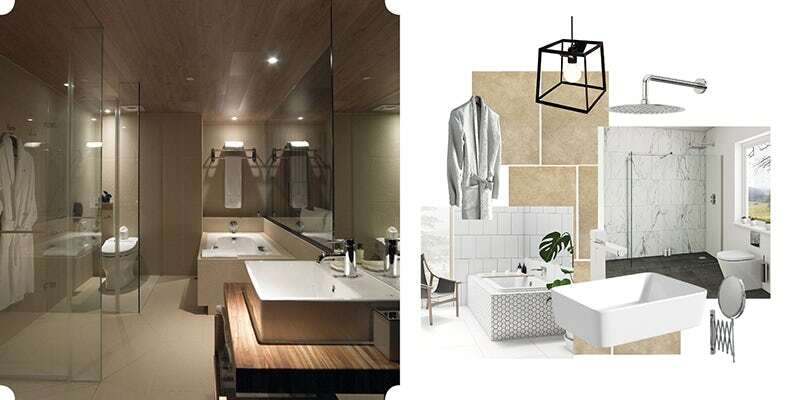 After viewing a number of top hotel bathrooms from around the world, we decided to create our own version of a hotel bathroom, complete with gorgeous his & hers baths and washstands. We've gone for a luxury look but with a contemporary twist. We’ve selected a pair of Mode Hardy freestanding baths and positioned them side by side, but, crucially, facing each other. So you and your partner can relax or chat to your heart’s content. We paired these with the equally contemporary Mode Flex freestanding bath filler tap. Old meets new with the The Bath Co. Traditional washstand with Camberley basin. With their metallic detailing and integrated towel rail, you and your partner can both get ready for a night out, or a night in, however the mood takes you. The Bath Co. Coniston basin pillar taps add to the traditional look and feel. We’ve seen a growing trend in dark interiors over the past year, so what better way to create the boutique hotel look than to give your walls a dark makeover? We’ve selected our own Craig & Rose royal peacock paint. Whilst, for the floors, we’ve gone with [Victoriana matt tiles], to add a more decorative feature. To add to the designer look and feel, we’ve also made a feature of the heating, with our Vertical white double column radiators keeping things nice and warm even when it’s frosty outside. Known for its gorgeous boutique style interiors and luxury rooms, Hotel du Vin has 17 locations across the UK. This bathroom from their Harrogate hotel in Yorkshire really caught our eye. It's a classical mix which is borderline boutique, epitomised by a simple, uncluttered style. Plus, with double roll top baths, you and your partner can both enjoy all the benefits of a relaxing bath, but with none of the discomfort of having to share. A truly excellent idea! If you are lucky enough to have space for two freestanding baths side by side, you can easily recreate this stunning bathroom. 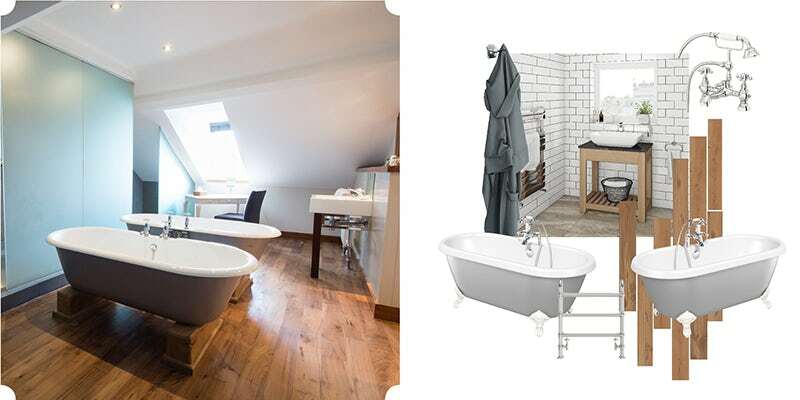 To keep with the classical theme, we'd recommend using 2 x Dove grey coloured baths next to each other. Just make sure the baths are positioned with the taps on the outside, so you and your partner don't need to strain your necks to chat. The Coniston bath shower mixer tap is the perfect accompaniment, with its classic detailing. To recreate the countertop and basin, we'd recommend The Bath Co. Hoxton oak washstand 600mm with black marble top and Baikal basin. We head abroad for our next hotel bathroom inspiration, to the world-renowned Hotel Quote in Taipei City, Taiwan. Whereas the Hotel du Vin is oh-so classical, the Quote comes up with a design that is ultra-contemporary. By using glass partitions instead of solid walls, the distinction between the bathroom and the rest of the suite is blurred, giving a light and airy feel that is integral to the overall room design. Create a seamless transition between your shower and the rest of the room with our Mode luxury 8mm wet room 3 sided glass panel packs. The Mode Arte back to wall toilet with its concealed cistern, gives a clean, contemporary appearance, and for luxurious showering add the Mode Spa round thermostatic twin shower valve with diverter and wall shower outlet set. 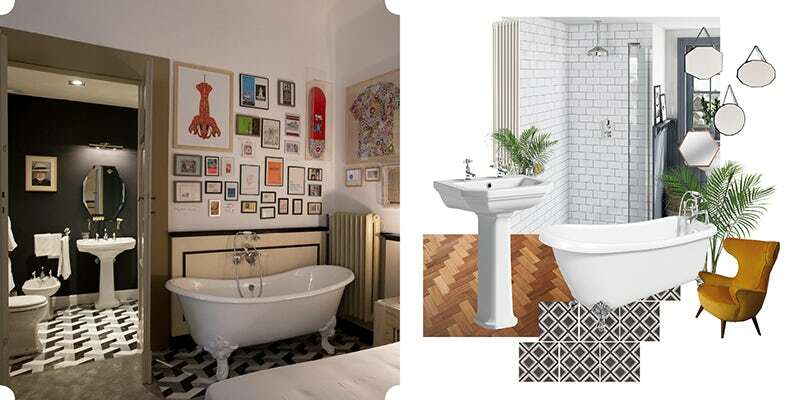 If you have the room, you could even recreate the sunken bath, using our Harvard inset bath. Did you know, Savoy Court is the only road in the UK where traffic drives on the right? As one of the grandest and most famous hotels in London, The Savoy really is full of surprises, but one thing that is guaranteed is the quality of its decor. Book into a suite and you'll find a classically-styled bathroom with lots of traditional touches, like a checkerboard floor and gorgeous gilding. Staying true to the grandiose period of the inter-war years, there are also some subtle nods to the art deco style. Our Traditional washstand with Camberley basin is a great place to start if you're looking to recreate this style of bathroom. Black and white tiling, a period style heated towel rail like our Dorchester heated towel rail and a classic roll top tub, like our Shakespeare bath, and you really are on your way to a truly regal hotel style bathroom. As romantic cities go, Florence is certainly up there with the best. Located in the heart of Tuscany, Florence is home to the stunning Ponte Vecchio, il Duomo and Michelangelo's David. It's also considered to be one of the top fashion capitals of the world, so it’s hardly surprising its hotels follow suit. We’ve picked out the AdAstra, which has some simply stunning bathrooms. Highly boutique in its style, it mainly features traditional touches, such as roll top baths, but in many cases, you will find the tub outside of the bathroom, forming part of the bedroom. A roll top bath like our Winchester slipper bath is a given, but it's also those clever little touches like [feature tiles], a traditional shower set, like the Coniston thermostatic shower valve with ceiling shower and sliding rail set and a classic pedestal basin, like the Regency, that combine to create this suitably fashionable Italian look. Bellissimo! Built in a former grain silo complex, The Silo towers over the Cape Town waterfront, and with Table Mountain providing the backdrop, it commands one of the most incredible views from any hotel room in the world. Indeed, the bathroom itself shares the same view, and the interiors are simply stunning, with opulence dripping from every surface. The look is luxury, with classic elements that are both graceful and timeless. 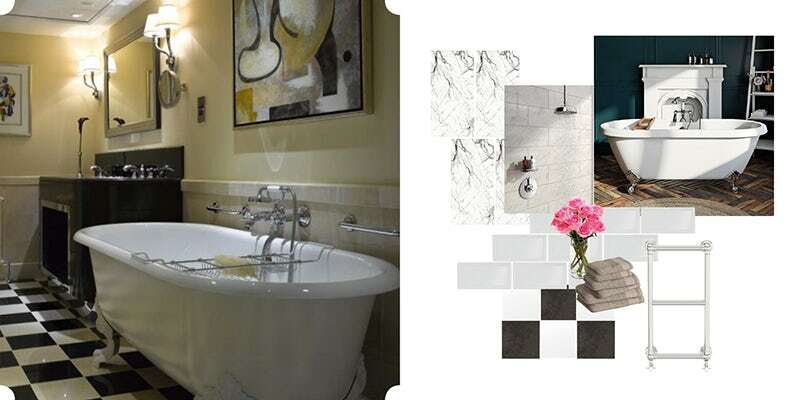 With this hotel bathroom style, it's the feature bath that really stands out. To create the same showstopping centrepiece, choose our Belle de Louvain Charlet freestanding bath. With an iconic hand-finished silver leaf exterior, why settle for anything less? A luxury bath demands luxury lighting, so why not add a Solen 5 light bathroom chandelier and let the cut glass twinkle as you bathe. 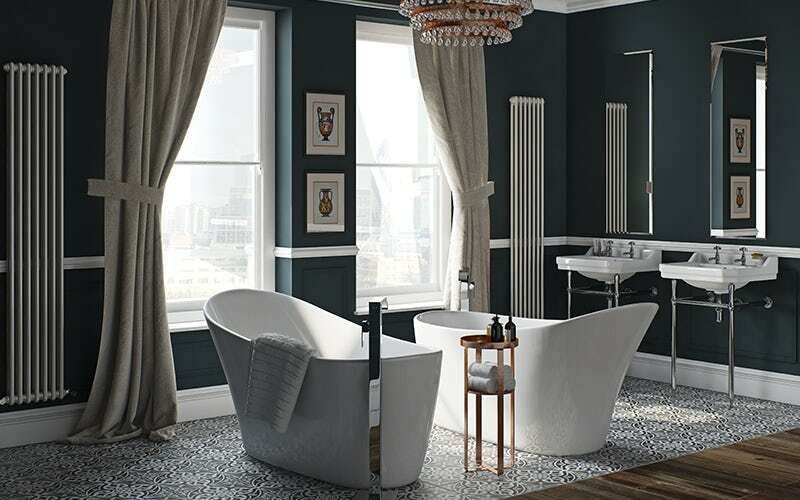 If you're feeling suitably inspired by all these beautiful hotel bathrooms, you can now get the look in your own home, with many of the products in this blog post featuring in our latest sale. Start shopping today. If you've been inspired by gorgeous hotel bathrooms, this style guide is the one for you. We'll show you just how to kit out your own bathroom for a look that would receive 5 star reviews on Tripadvisor. A well-appointed bathroom is something that can make a hotel stay really memorable. Top interior design writer Helen Powell of DesignHunter.co.uk takes us through 3 of her favourites. Some of the most luxurious bathrooms in the world are to be found in gorgeous boutique hotels. However, you can easily recreate the hotel chic look in your own home with help from our handy mood board.